I hope for Michaela Bates Keilen’s sake that she gets pregnant soon. The newlywed clearly had a serious case of baby fever tonight on Bringing Up Bates, and my heart went out to her. There is no doubt Michaela wants to be a mom. 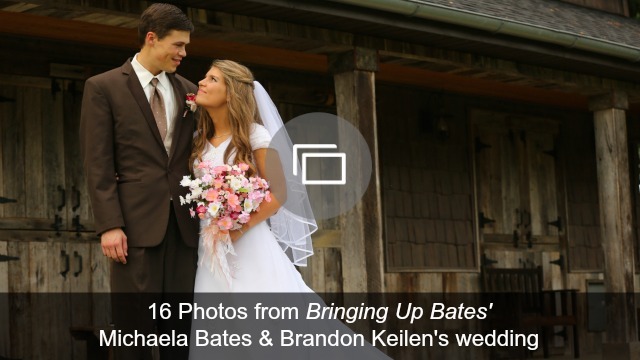 She might even be the one in the Bringing Up Bates clan to follow in Kelly Jo Bates’ footsteps and have 19 kids, she loves them so much. Her family even lovingly referred to her as a “baby hog” as she met Zach and Whitney Bates’ new little baby, Kaci Lynn. “Whenever Michael’s in town, you know she’s got a baby scooped up in her arms,” Kelly Jo said. Michaela didn’t even hide the fact that she was not sharing any of the Kaci Lynn holding time. She kept that baby in her arms throughout the entire picnic, except, it seemed, to let her husband Brandon Keilen hold her. Even Brandon seemed to be in on the baby feels. “Brandon loves children and when Brandon comes, he doesn’t have an empty spot within 10 feet of him because kids are just swarming,” Kelly Jo said. Clearly, these two are made to be parents! I’m expecting some baby news outta these two any day now. Maybe the season finale? Though I can’t imagine Michaela would be able to contain her excitement long enough to keep that secret. Do you think Michaela Bates could be hiding a big baby secret?